I believe diversity matters. We’re better when we hear from a diverse range of voices. But if we’re not intentional about embracing diversity, it doesn’t happen. I got my We Need Diverse Books swag in the mail today, my reward for supporting their highly successful Indiegogo project. I read a lot of books last year (203, not that I’m bragging), and I was curious how diverse my selections were. I made an effort to read more diverse books in 2014 (in part thanks to We Need Diverse Books), but I was also curious about previous years as well. Defining diversity is kind of tough. Sometimes you don’t know an author’s or a character’s ethnicity. In this case I made my best guess and counted any book with a non-white author or primary character (I didn’t chart other kinds of diversity—gender, sexuality, disability, religion, etc.—just because it was getting complicated). I’m sure I’m off in places. Notice that for much of my reading, diverse books are practically nonexistent. 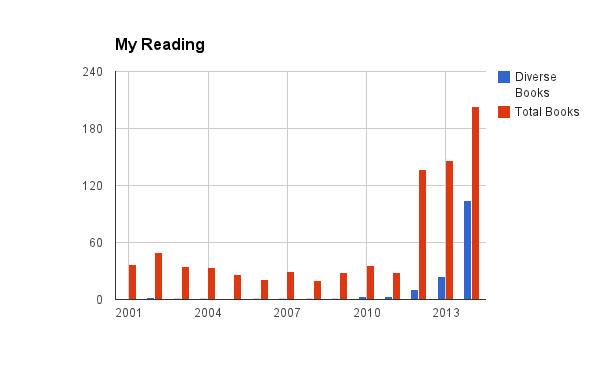 In terms of actual numbers, between 2001 and 2011 that meant between 0 and 3 diverse books, but usually only 1. My diversity ratio started to go up in 2012 (11 diverse books out of 137 total books; 8%) when my general reading increased dramatically. But more than just a product of reading more, I intentionally sought out diverse authors that year, including David Anthony Durham, Mat Johnson and Colson Whitehead. It continued to improve in 2013 (24 out of 146 total; 16%), though that’s primarily because I went on a civil rights kick, reading about the movement and falling in love with Pauli Murray (read everything she published). I intentionally sought out diverse books in 2014 and it shows (104 out of 203 total; 51%). Does a Character’s Race Matter? Doesn’t the story matter more than the character’s skin color? Sure. But in all my reading I’ve noticed that for white characters and authors, race is generally not an issue. But for authors and characters of color, race can’t help but come into play, even when it’s not central to the story. Why is that? My guess is that colorblindness is only something white people can get away with. The rest of the non-white world is all too often reminded of their race. I’m pointing this out to illustrate that if we want diversity we have to actually seek it out. Diversity doesn’t happen automatically or by accident. If it did, my 2001 to 2011 reading would have a lot more diversity. Being intentional is how I started to read significantly more, and it’s how I read more diverse books. 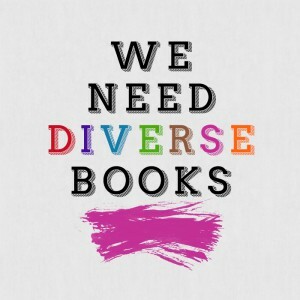 I’ll be the first to lament how hard it is to find diverse books. That’s why We Need Diverse Books is awesome. They’ve got some resources that can help, including their summer “If You Liked X, Read This Next” series. They’ve also got a cool flowchart breakdown that can help.